Needing a fresh start, Stanley Washburn and his daughter, Susanna leave Philadelphia for Red Gorge, Dakota Territory. Stanley’s nephew, Jared Hopkins has arranged for his uncle to purchase The Lucky Seven saloon, but Susanna isn’t sold on life in Red Gorge. When the town’s banker, Percy Benjamin is murdered, her family is caught in the middle of the ensuing investigation. In the sheriff’s absence, the new U.S. Territorial Marshal, Seth Davis is called in to handle the case. 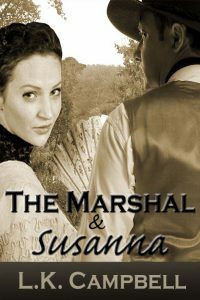 Susanna has been attracted to Seth since they met on the stagecoach coming into town, but her attraction might not last long when Jared becomes Seth’s prime suspect.